Tony Stark, Agent Of S.H.I.E.L.D.? Avengers: Infinity War promises to be an all-action heist movie in which the world's heroes struggle to protect the world from the threat of Thanos, the Mad Titan. But right now, we have simply no idea what to expect from Avengers 4, due to release on May 3rd, 2019. Will it simply continue Thanos's arc? Will the Celestials be involved? Will we have a "Secret Invasion?" There are fan theories a-plenty, but precious few facts. The scenes in question appear to be flashbacks. You'll note that in one of them, Tony Stark is wearing the exact same shirt he wore in The Avengers, and even has a minor head injury. In the other, he's wearing a S.H.I.E.L.D. uniform, so we'd assume the scene is set before Cap brought down S.H.I.E.L.D. in The Winter Soldier. Now, let's face it, these set photos are pretty strange. Up until now, we'd only ever heard Stark referred to as a S.H.I.E.L.D. consultant. He'd never seemed to be a member of the organization. What's more, it's also puzzling to see that Tony would ever settle for wearing a S.H.I.E.L.D. tactical vest rather than a suit of armor. Unless, that is, this scene is set shortly after the events of The Avengers. With Stark Tower heavily damaged, and his latest suit of armor in a state of disrepair, he might have simply had to accept whatever protection was on hand at the time. But all that leads us to one curious question: Is it possible that these scenes aren't flashbacks? As any fan of Agents of S.H.I.E.L.D. knows, Agent Coulson reformed the organization after the Hydra uprising. Curiously, Disney actually intervened to force ABC to sign up to a fifth season of Agents of S.H.I.E.L.D., which will come to an end right around the time of the premiere of Infinity War. It's possible that S.H.I.E.L.D. will be heading back to the big screen, and that Stark will wind up working for them in Avengers 4. In the comics, he actually became Director of S.H.I.E.L.D. for a while. At the same time, though, that's unlikely. 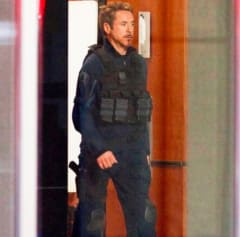 Tony's clothing definitely suggests a flashback sequence to The Avengers, and we've also had other set photos that tease flashback-style technology. 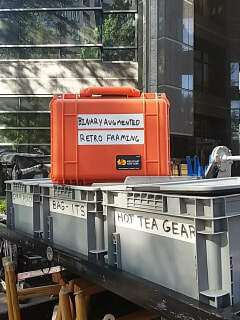 The Binary Augmented Retro Framing (B.A.R.F.) technology played a key role in Captain America: Civil War. That was the name of the virtual reality technology pioneered by Stark at the film's opening, when he revisited the day his parents died. Putting the pieces together, it looks as though Tony uses this tech to relive an event in the immediate aftermath of The Avengers. We already knew that Avengers 4 would feature flashbacks of some kind. A casting call described a scene set in the '60s, while fans have noted that Zoe Saldana and Karen Gillan have been seen wearing their costumes from the first Guardians of the Galaxy film, not the sequel. With the Time and Reality Stones in play, it's entirely possible we could see the creation of an entirely different timeline, with flashbacks — and possibly even B.A.R.F. — used to explore it. The mystery of Avengers 4 seems to deepen with every set photo. Marvel is wary of giving too much away, not even confirming the film's title out of concerns it would be a spoiler. For now, we can only look at each new detail with a growing sense of excitement.